This is an extraordinary account of survival in the Great War. The author was persuaded to tell his story at the age of 82, proving that it is never too late to try to draw primary information from someone who was there. His account has been sensitively edited and introduced by a veteran of WWII, Joy Cave of the Woman’s Auxiliary Air Force. There is a photoplate section with appropriate supporting images and this is an entertaining and moving account of the terrors of trench warfare and the power of the machine gun. DESCRIPTION: This is an extraordinary account of survival in the Great War. The author was persuaded to tell his story at the age of 82, proving that it is never too late to try to draw primary information from someone who was there. His account has been sensitively edited and introduced by a veteran of WWII, Joy Cave of the Woman’s Auxiliary Air Force. There is a photoplate section with appropriate supporting images and this is an entertaining and moving account of the terrors of trench warfare and the power of the machine gun. The author had a clear memory at 82 and shows a determined sense of humour. 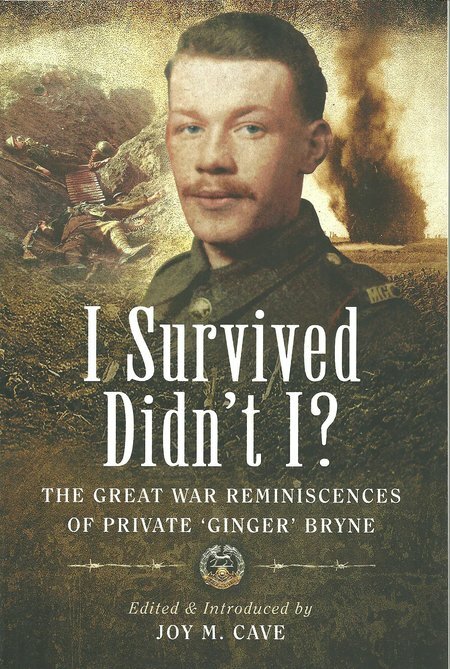 Unlike accounts from senior officers who are the most numerous authors of military combat, ‘Ginger’ Bryne was a common soldier who had to make sense of the small window of experience open to him, having no knowledge of the grand plans of the generals. As a result he is telling a very personal tale, showing how he survived and came home to tell his story. This is an account that no enthusiast of military history should miss.